Are Big Banks in the Government’s Cross Hairs? Last week, JP Morgan Chase settled yet another banking fraud case for a cool $18 billion – the largest single settlement ever for an individual company. As the US Department of Justice readies yet more criminal charges against Chase and other megabanks, some financial experts question whether the government’s targeting of the nation’s largest financial institutions is backfiring. The Chase settlement joins a long list of recent outcomes to lawsuits pressed by the Justice Department and other entities against the country’s biggest banks for a variety of civil and criminal charges. The case against Chase, like many of the other suits against the bank and its cohorts including Bank of America and Citigroup, involves “misrepresentations’ made to bank customers and other investors,much of which stems from the 2008 housing collapse and its aftermath of massive foreclosures and fraudulent lending practices. Industry watchers point out that these dire predictions have yet to manifest, amd that it’s essential to establish safeguards around an industry that, when largely unregulated, was responsible for the housing industry bubble and crash in 2008 as well as a string of clearly illegal and fraudulent actions at home and abroad in the years following. 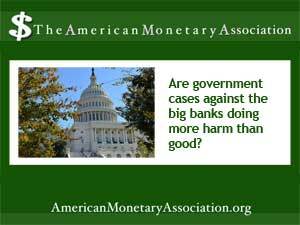 They argue that to give the big banks a pass on criminal behavior places consumers at risk and encourages abuses.